There’s this door that I have to walk through every day. It sits in between our locker rooms and our athletic training room. This door is no ordinary door. It is this giant grey steel door. It connects two buildings underground: French Field House (where our locker rooms are located) and St. John’s (where our athletic training room is located). I have no idea how much it actually weighs, but it feels like it weighs 500 pounds. The reason it feels this way is because French Field House has these ridiculous air circulation patterns that make every door in the building resistant when you try and open them. This door, in particular, far surpasses any other door I’ve ever encountered in terms of difficulty of opening. Everyone that uses French Field House knows which door I’m talking about– it’s a monster! I mean sometimes I have to actually body slam the door three of four times before it even budges. This is the door that I am talking about. I remember my freshman year, when I couldn’t get the door open on the first try, I would just assume it was locked. I wouldn’t even try to mess with the door. I would walk back to the locker room, get my stuff, and go home without going to the training room (freshman me didn’t understand how important the training room actually was to the health and rehabilitation of my body). My sophomore year, I would try a few times. Sometimes after messing with the door a bit I could get it to work. But some days, honestly, I was just too tired to fight another battle in my day, and the door would win. My Junior year, I started getting sick of loosing to the door. Surely the door wasn’t actually locked all of those times I couldn’t get it open. I started banging on the door whenever I couldn’t get it open, hoping that somebody was on the other side and could help me. Many times, this worked out really well. But even then, sometimes I was the only one in that part of the building, and I would take another “L” to the door. I am now a senior, and I am sick and freaking tired of taking “L’s” to that door. I throw my weight against that door seven or eight times sometimes, but I refuse to ever tell myself that the door is locked. Because I’ve been here for four years now, and that door has never actually been locked. Sometimes, I am just too weak to get it open. I simply need to try harder. Every track season, I choose a book to read while we are traveling. We have lots of free time on busses, in airports, on planes, and sitting at the continental breakfast in hotels. This past indoor season, I chose Love Does by Bob Goff. My sister got me the book for Christmas and she was so giddy when she gave it to me. “Rach, you are going to LOVE it!! !” She was actually jumping up and down when I opened it. And she was right. The book was amazing. And in one of my favorite chapters of the book, Bob tells a story about his life that reminds me a little bit of this giant door that I have to open every day. 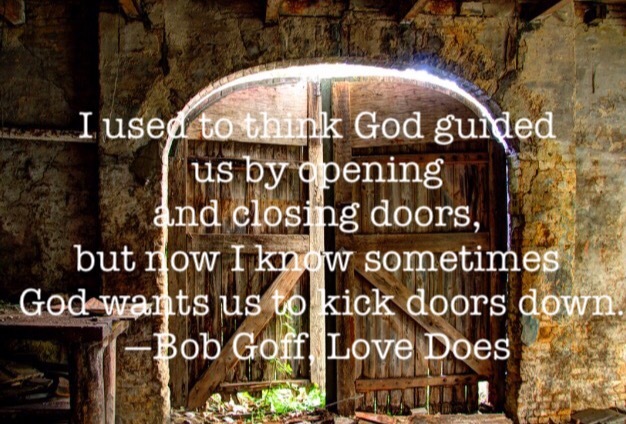 Bob is talking about the way that he got into law school (which was pretty incredible), and he says, “I used to think that God guided us by opening and closing doors, but now I know that God wants us to kick some doors down,” (2012, Goff, p. 38). Kick some doors down. One day, I was on my usual trip from the locker room to the athletic training room, and I noticed that the door was wide open. Upon further observation, I had noticed that someone had taken (I don’t even want to know how much) athletic tape and taped the steel arm at the top of this industrial door so that it remained straight and wouldn’t bend. By taping that bar straight and preventing it from bending, the door was not able to shut. They then had shoved a bunch of tape in the hinge of the door so that the door wouldn’t rotate and close even if the arm somehow had become loose. And they did all of this just with athletic tape. Pretty impressive that simple athletic tape was doing something that I had difficulty with for four straight years. Somebody saw that door in a way that I haven’t been able to see it before. Rather than complaining that it was “locked” all the time, rather than wasting energy and running themselves into the door day in and day out, they simply got rid of the door. They had kicked the door down in their own way. Unfortunately, the door is actually shut again. I’m pretty sure that the university 1. Didn’t approve of the way that athletic training materials were being used not for athletic training and 2. Didn’t love the janky look of a nice industrial door all taped up. However, I am forever thankful to whoever saw the door in a different way and actually taped it open for a week. For starters, it saved me a ton of energy every day. But it also got me thinking about the way I approach other doors in my life. Sometimes, I think that I am so afraid of what might happen if I kick a door down, so afraid of what someone might say or think if I take athletic tape and tape open a steel door, that I just turn around and walk on home, telling myself the lie that the door was probably locked anyways. Or sometimes, I think I tell myself that if I go to kick the door down, I might not be strong enough or smart enough to get to get the job done. And sometimes I think I’m just waiting on someone else altogether to come kick the door down for me. And honestly, some of those things might be true at times. I can barely bench 100 pounds. I got a D+ in Organic Chemistry my sophomore year of college (It’s two years later and my type A personality still can’t let that one go). And sometimes, I get so stressed out and feel like a million things are slipping through the cracks that I go sit at the top of St. John’s Arena (and cry and call my mom) because I feel like I’m not doing a good enough job at life. But here’s the thing: I believe that I am loved by Jesus. And I believe that being a Child of God gives me the power and ability to kick down doors despite my imperfections. I have a quote that has hung by my mirror every day since fourth grade. I first heard this quote in Akeelah and the Bee (my favorite movie when I was younger), and have read it every day ever since. Our deepest fear is not that we are inadequate. Our deepest fear is that we are powerful beyond measure. It is our light, not our darkness that most frightens us. We ask ourselves, Who am I to be brilliant, gorgeous, talented, and fabulous? Actually, who are you not to be? You are a child of God. Your playing small does not serve the world. There is nothing enlightened about shrinking so that other people will not feel insecure around you. We are all meant to shine, as children do. We were born to make manifest the glory of God that is within us. It is not just in some of us; it is in everyone. And as we let our own light shine, we unconsciously give others permission to do the same. As we are liberated from our own fear, our presence automatically liberates others. My favorite line in this is, “Your playing small does not serve the world.” I think when Marriane talks about playing it small, she is talking about the doors that we walk away from because we are too afraid to kick them down. But walking away from a door and just accepting the fact that “it feels like its locked” doesn’t really do the world any good. Playing it small is really easy. It’s safe. It’s secure. And it doesn’t expose failure. But playing it safe is also settling for mediocrity. I have this friend, Jess, and she constantly is reminding me NOT to play it small. She tells me to dream big all the time, and believe in my abilities as well as the abilities of other people. She has this coffee mug that is one of the best coffee mugs that I’ve ever seen. 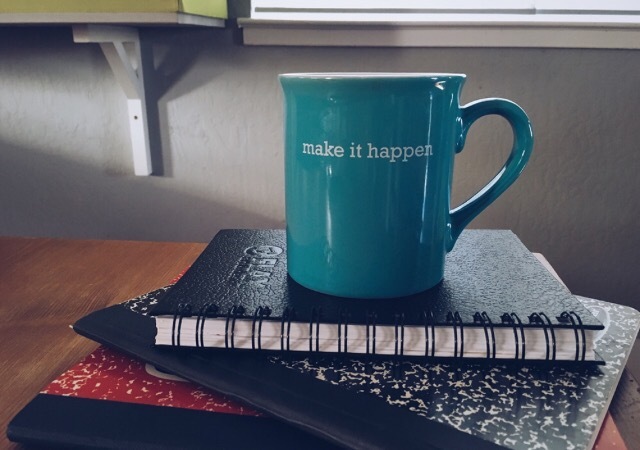 It is an amazing blue, and all it says on the side is, “make it happen.” Jess is a make it happen kind of person. A couple years ago, we were having a conversation in a running store, and she was talking about her decision to compete at Michigan State while she completed her masters. She said something to me that I will never forget. I remember because I wrote it down right after she left the store. But she is so right. Going for something, refusing to play it small is risky. But why settle for mediocrity? Why not play it big? And why not kick down some doors along the way? Right now, there are a bunch of doors that my teammates and I are trying to kick down. We are all trying to be All-Americans. Be Big Ten Champions. Be Students. Be young professionals. Be good sisters. Be good daughters. Be good friends. Eventually we want to be good wives. Be good parents. Be good grandparents. And in our attempt to be all of those things, there are so many doors that we have been faced with and will continue to be faced with. It’s scary. It’s challenging. It’s an adventure. But I’ve found the more I do things that are scary or challenging or test my limits in life, the more I see how Jesus is faithful, and the more this adventure actually becomes adventurous and isn’t stale. Because at the end of the day, when I am standing at the door completely afraid to start kicking it down, God reminds me that He has given me the power and the strength that I need. He just wants me to trust Him, stop playing it small, and start kicking it down.